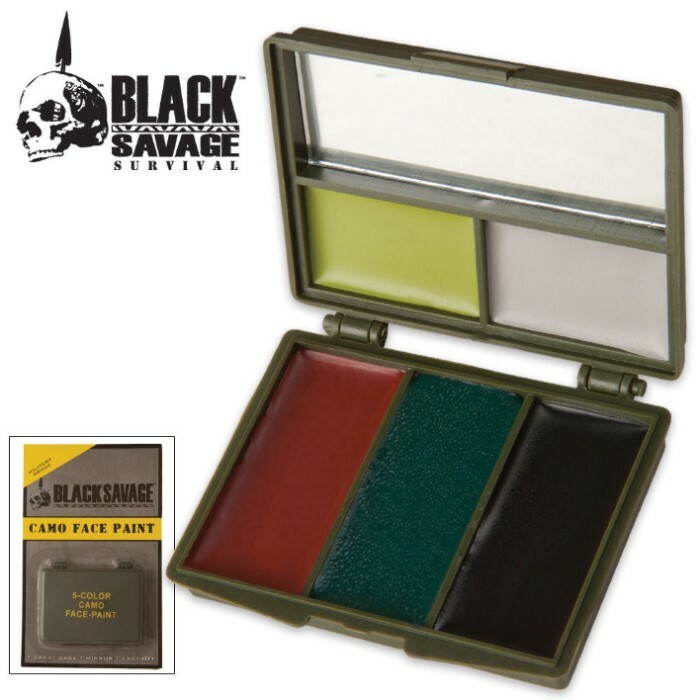 5 Color Hunting Camo Face Paint Kit | BUDK.com - Knives & Swords At The Lowest Prices! This G.I. type face paint compact is all you need to create dozens of camouflage combinations and patterns. Includes these colors: light green, grey, black, olive and brown. Handy size container,good instructions on use,easy application and removal,well worth the price. First, we have to protect our rights to BEAR ARMS..Let our government know we will NOT STAND FOR IT. And they will not take our guns and rights to protect our families and ourselves. Now back to another great product from CH, the camo paint worked great. It went on easy, stayed on, and after it washed off easy, and didn't have to take 2 layers of skin, you guys know how that is. And to top it off it had a real mirror and you could actually see your face. Another good good. Great Product! This will give you lots of camouflage Paint at a great price, the best part is you get what you pay.